Meet our Queen of Enrollment and Outreach! Have a policy question about Medicaid? 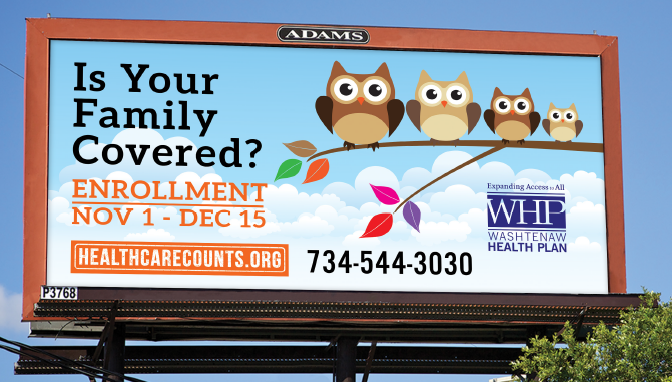 Need to know the best way to make sure an entire family has health care? Want to understand the difference between QMB and SLMB, or SSI and SSDI? The go-to person in the WHP office is Krista Nordberg. Krista Nordberg has spent the last 25 years working as an advocate for people's rights through the legal system as a lawyer and legal advocate. She has provided legal representation and assistance for low-income clients in the areas of housing, consumer and family law. As the Assistant Director of the Counsel Advocacy Law Line she supervised a team of attorneys who performed legal intake services, case reviews and advice for 12,000 clients per year. While working for Legal Services of South Central Michigan (LSSCM), Krista worked as a Staff Attorney (Ann Arbor) and Managing Attorney (Lansing). Since 2007, Krista has been the Director of Enrollment and Advocacy Services at the Washtenaw Health Plan. She has trained and nurtured various staff members and AmeriCorps Community Resource Navigators (for example, Haley Haddad, Amber Wells, Michael Randall and Will Cheatham), all of whom have progressed in their careers with a strong sense of advocacy. Krista rocks the orange safety vest as she has people check in at a fire safety drill. As our Queen, I mean Director, Krista leads the fight for healthcare coverage for all through the Washtenaw Health Plan. Krista is known for sharing enrollment policy updates, answering questions from case managers across the county, providing leadership and collaborating with Michigan Department of Health and Human Services for Medicaid enrollment and advocacy, leading a staff trained as Certified Application Counselors for the Marketplace, and--in general--spreading the message that healthcare matters. Krista and her daughters, Lucy and Sally. Krista has won the Washtenaw County Manager of the Year, the NAACP Distinguished Lillian D. Wald Civil Rights Award and she was a Commissioner on the Human Relations Commission for City of Ypsilanti. But she doesn't want you to know about those awards. Awards, in her opinion, are not as important as people getting healthcare, human rights and justice! And she dances! Krista loves salsa and travels to dance in California, Cuba or anywhere there is a good rueda. She has two wonderful, smart daughters and lives in a tiny house with a cat, Logan. In 2013, as the Washtenaw Health Plan was searching for an Americorps volunteer to be a Community Resource Navigator, the resume of Michael Randall crossed the desk of Krista Nordberg, WHP's Director of Enrollment. That turned out to be the right choice, because Michael found value in the work and has a great way of connecting with people. As a Community Resource Navigator, Michael worked with agencies across Washtenaw County supporting the implementation of the Healthy Michigan Plan (Medicaid) and providing access to health care and food assistance for families and individuals. He trained nonprofit employees and volunteers to provide access to public benefits. When his Americorps time was up, Michael stayed on with the WHP. Michael discussing the Affordable Care Act and its impact. "Michael worked with mutual clients at the Community Resource Center during his time as an Americorps Community Navigator. His calm, understanding manner really helped the clients feel at ease when talking with him about their needs and situation. His approach was empathetic yet informative and built confidence in the client. I can see Michael's future as a leader in human service advocacy or politics." In fact, Michael Randall is a tireless advocate for individuals. He started helping people back in 2006 as a Patient Attendant, as he was working his way through college. He continued working with individuals as he transitioned to an internship at the Ypsilanti Housing Commission-Chesapeake Community Partners. In the midst of all this work, Michael married the love of his life, the lovely Alaina, in June 2015. Michael and Alaina are vegans who love to cook and eat together. In his spare time, Michael is also the President of Bridge Young Adult Ministries. Michael found a new appreciation for all that libraries and librarians do when he became a Trustee of the Ypsilanti District Library in 2015. Michael Randall being sworn in as a Trustee of the Ypsilanti District Library. If Michael had a personal slogan, it would certainly include the word Community. It is part of all that he does every day. WHP is lucky to have his smile, enthusiasm and tireless advocacy. He really does embody our unofficial tag line, We Help People. Thanks, Michael Randall, for making sure that Coverage Counts!